THE HOTEL IS SMOKE-FREE HOTEL.NO-SMOKING IS PERMITTED IN THE SUITES AND IN THE PUBLIC AREAS. 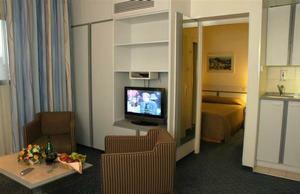 The Best Western Regency Suites is a small and cozy all-suites hotel and has 30 well appointed one-bedroom suites. The Best Western Regency Suites is a small and cozy all-suites hotel and has 30 well appointed one-bedroom suites. 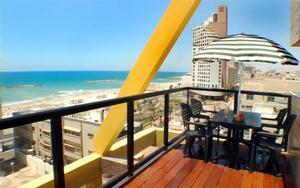 The hotel is located on 80 Hayarkon street, one of the best locations in Tel Aviv. 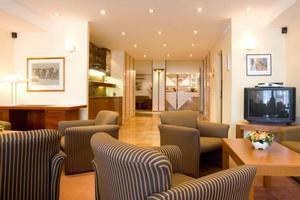 The hotel is surrounded by many restaurants, cafes, banks, embassies and airline office. Ben-Yehuda and Dizengoff St. are within a walking distance for shopping. The beach and the promenade are just across the road. Free WI-FI connection to the Internet. Free parking for the hotel guests. The hotel is suitable for long stays, as it is in fact a small and cozy apartment with Kitchenettes, the hotel offers a laundry service, FREE Wireless Internet connection, facilities for the disabled. Each of the one-bedroom suites includes a living room with 2 armchairs and a sofa which converts into a double bed. A bedroom with double of twin beds. En-suite bathroom and shower. The suites are large enough to accommodate 4 people in comfort. All the suites are fully air-conditioned, WI-FI Wireless connection to the Internet FREE, radio and cable T.V and direct dial telephone. Fully equipped kitchenette that includes a refrigerator, a toaster oven or a microwave, an electric kettle, a set of crockery and cutlery for 4, hot plate, pots & pans and other kitchen utensils that are supplied FREE on request. The hotel is conveniently located on 80 Hayarkon street (city center), just a few minutes away from the lively Old Jaffa, adjacent to all major international airlines offices, embassies, art galleries, boutiques, department stores, supermarkets and banks. Ben Yehuda and Dizengoff streets are within a walking distance for shopping.The hotel is surrounded by many restaurants featuring international cuisine and many indoor and outdoor cafes. Tel Aviv International Airport is only 15 kilometers away.